Tomorrow, at GMT 3:00 p.m., the United States Census Bureau will release the New Home Sales figure that measures the annualized number of new family homes sold during the last month. Since the sale of a new home usually cause an increase in a wide ranging economic activity, such as sales of new furniture, new mortgage for the home, etc. ; binary options investors always considered the New Home Sales figure to be a leading fundamental indicator of the US economy. Last month, on a year-over-year basis, total 511,000 new homes were sold in the United States, and this month, the forecast is set even higher, at 521,000. 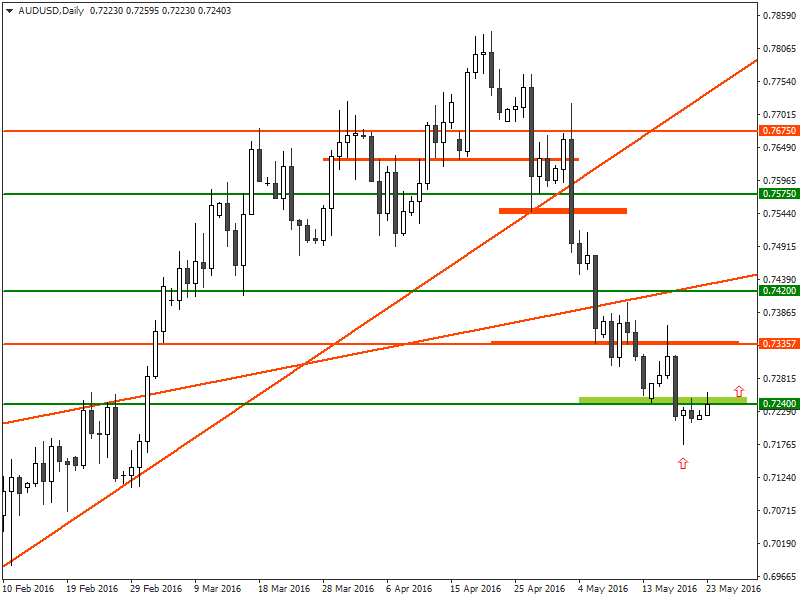 After falling around 660 pips since April 21, last week, the AUD/USD formed a minor bullish pin bar on May 19. On May 20, the AUD/USD price penetrated above the high of the pin bar, which confirmed that there would likely be a bullish retracement move soon. Today, the AUD/USD price has penetrated above the high of Friday and currently the price is trading above the important psychological resistance around the 0.7240 level. As the US new home sales figure is expected to come out this week, with a forecast of an improvement compared to the previous month, the fundamental outlook for the AUD/USD would likely remain bearish. However, if the AUD/USD price closes above the 0.7240-0.7250 level, it would certainly attract additional bullish momentum in the market. Under the circumstances, it would be recommended that binary options traders consider placing a CALL order for the AUD/USD with their binary options brokers once the price closes above the 0.7240 level.